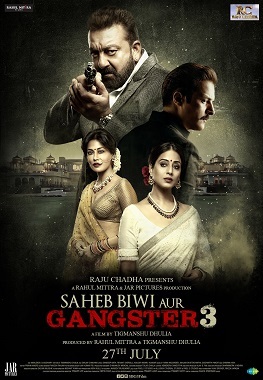 Saheb Biwi Aur Gangster 3 is the 3rd instalment of a modernisation of Guru Dutt’s classic Sahib Biwi Aur Ghulam. Just like the original there is an all-powerful Saheb. His devoted wife represented by the character Biwi. Then there is the Gangster. This version’s Gangster is Sanjay Dutt. The music for the film is heavily tuned towards folk and modern Punjabi music to match its setting. Throughout the avatars the producers have not been set on any one music director and have continued that trend here by using Rana Mazumder, Aanjan Bhattacharya and Siddharth Pandit to create the soundtrack. No better place for the album to begin then with Sanjay Dutt’s theme song: Baba Theme. Revant Shergill is called upon to give a dark and slightly off pitch rendition. It sounds faintly of the James Bond theme, but its darkness is certainly evident. Synth instruments are kept quiet but seem to reek foreboding, saying ‘here comes the Gangster’. A rap break in the middle brings this song to completion as it could have been a good minute shorter and still conveyed all that needed to be said. What would the Saheb’s house be without his courtesans to provide entertainment? Kesariya Jugni sung by the Nooran Sisters and Amit Gupta is that song. A sped up classical song, its reminiscent of Punjabi folk music with local instrumentation and an electric guitar to bring it into the 21st century. It manages to give the audience a feel for location and time frame for the film but is very repetitive with its lyrics failing to last through till the end of this 4-minute song. ‘Lag Ja Gale’ is a classic old times song by Lata Mangeshkar. From the film Woh Kaun Thi, its mysterious rhythms and haunting melody give Lata the perfect platform for a sad love song. The music directors felt that Jonitha Gandhi could do this job as well, so we have the next song in this album, a new Lag Ja Gale. There is no mysterious and haunting backing, just a drum which occasionally drowns out the singer and all it really proves is there is only 1 Lata, especially in her heyday. For a bit of class, we have Arijit Singh in for the next song Andheron Mein Rishtey. This is paired with a later female version sung by Mandakini Bora. Both are based around the dark theme, but both are a bit livelier. There is a continuous beat, but it feels very one-paced. The singer backed by muted trumpet and violins and more of the vague James Bond motifs. Mandakini Bora isn’t in the same league as Arijit as her modulations are not as strong as his, however there is no real difference here. Again, the song certainly could have been a minute shorter and still conveyed the necessary point as there isn’t even a rap break here to break up the songs a bit. Another look back on the past is Aye Huzoor by Sunidhi Chauhan and Shaan. For those who can remember back to when both singers were consistently prominent, this is a great song and feel. It sings not of a newly found love but an existing love that has maintained itself for such a long period. The sitar and synth fusion that makes up the background of the song make for a very nice sound. Due to its upbeat nature, its very different to all the other songs and gives the audience and the album a break from all the sadness and darkness so far. Usha Uthup is up next with what seems to be a remake of her classic Ramba Ho Ho Ho, a superhit from the film Armaan from 1981. Very racy, very dance inducing this mix of samba and salsa couldn’t be further away from the motif of this album if it tried. Yet it works very well as a mood changer and being reminded of such a classic song is not a bad thing. It’s a good mix of classic and western styles, lively and fast paced and a duet love song with beautiful lyrics like “Dil ka parinda, pinjare se udne do”. The album ends with something more akin to Mugal-E-Azam or Devdas in Davaa Bhi Woh. Saberi Bhattacharya delivers an emotional classical based song with plenty of modulations about how her love is both her medicine and her poison. The song feels like it has exactly the right length, exactly the right singer and exactly the right feel for both the film and the song’s lyrics. This album is far longer than most recent albums with 8 songs over about 35 minutes. There are some gems to be had: for those who love a bit of classical ‘Davaa Bhi Woh’ will appeal, for those who love the dark themes Baba Theme stands out. The dancers will get into ‘Dil Ka Parinda’ but overall so many of these songs seem inspired by some great old hits and don’t match up to them in all cases. It is an interesting change; a lot of remake songs recently have just taken the old song and added beats and sampled parts as per want. The actual effect it may have in the film is hard to tell with such variance in the song styles too, so it gets a mid-rating. 15 queries in 0.342 seconds.